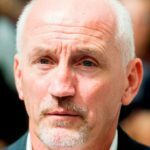 Barry McGuigan is an Irish retired professional boxer and current boxing promoter. Born in Clones, County Monaghan, Ireland, McGuigan was nicknamed The Clones Cyclone and became the WBA and lineal featherweight world champion. "What I would say about Barney Eastwood is that when our relationship worked, it worked extremely well. He had a lot of strengths as a promoter and a manager."